I have the memory below and I am looking at using the one below it, would it be OK to use? It appears to be a faster speed, is that OK? Also, mine says PC 4200, the new one says PC 2 5300 and the frequencies are different. Do you think this would work or not? I know I could use crucial.com and stuff but I really want to buy something local today. OK, I just realized on crucial.com this is my 1st result for a match, so I guess it should work. It will work although keep in mind the lowest common denominator will be used. In other words the new memory you put in will run at the same speed as the slower stick. To check for compatibility Crucial's Scanner is very good. Update: John's inquisitive points made me look at the 'PC-4200' part more closely. I was wondering how DDR and DDR2 were being confused like this. It is possible that the OP has PC-4200 confused and it is probably PC2-4200. All this would be clearer if the motherboard model is listed for reference. The line "1024 MB DDR2, 533 MHz, (PC4200) dual channel memory" also matches PC2-4200. If that memory is PC2, he has a DDR2 board and Crucial confirming PC2-5300 works on it is good news for the OP. First thing to understand, DDR2 is different from older DDR. DDR2 SDRAM is a double data rate synchronous dynamic random access memory interface. It supersedes the original DDR SDRAM specification and the two are not compatible. In addition to double pumping the data bus as in DDR SDRAM, (transferring data on the rising and falling edges of the bus clock signal), DDR2 employs an I/O buffer between the memory and the data bus so that the data bus can be run at twice the speed of the memory clock. The two factors combine to achieve a total of 4 data transfers per memory clock cycle. So, if you motherboard uses PC-4200 (DDR) memory, it is not likely to support PC2-5300 (DDR2) memory. MSI Unveils DDR2+DDR3 Combo Motherboard. MSI showcased two amazing motherboards at CeBIT: its AM3 board 790GX-8D featuring the 790GX chipset, and its socket 775 board P45-8D using Intel's P45 +ICH10/ICH10R chipset. What makes these two boards so extremely hot is their huge memory capacity, both offering four DDR2 slots and four DDR3 memory slots. Nicknamed as the "Memory Lover," both utilize MSI's power saving technology APS as well as its "DrMOS" high quality voltage converters. Out of the two, the 790GX-8D seems a bit more versatile, compatible with AMD's AM3 processors with DDR2-1066 or DDR3-1333 RAM (using bypass) while also capable of supporting the AM2+ CPU with DDR2 RAM. Up until now, you had to choose between DDR2 or DDR3, but not both. But, all that is for DDR3 and DDR2, I strongly suspect no such support is made for DDR and DDR2 -- and, if it is, you are unlikely to pick such a motherboard. Yes, it usually works, because RAM usually is downwards compatible. For example, your MoBo and CPU can only handle a DDR-2 PC4200 (533 Mhz), but you go and buy DDR-3 PC5300 (677MHz). The new bought DDR-3 PC5300 (677MHz) will then be run as DDR-2 PC4200 (533 Mhz). You haven't won anything performancewise. You just have reservers until your new MoBo and CPU can handle DDR-3 PC5300 (677MHz) then the new RAM will run as this. Usually you have to adjust settings in your BIOS. 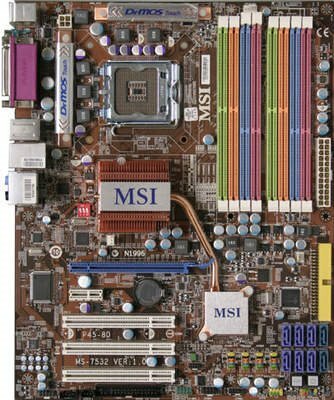 ASUS M4A79 Deluxe Motherboard & DDR2 800/1066 Memory Compatibility/Limitation? Can somebody explain this mystery of why these memory pinouts don't match?